The 20th edition of FICCI frames that was held in Mumbai from 12th to 14th March ended on a successful note. The three-day event saw a series of enriching and insightful sessions around media and entertainment industry. The discussions revolved around various platforms in Print, digital and broadcast with imminent personalities like Mr. Amit Khare, secretary, I&B ministry. Mr. Uday Shankar, Vice President, FICCI, Yaduvendra Mathur. 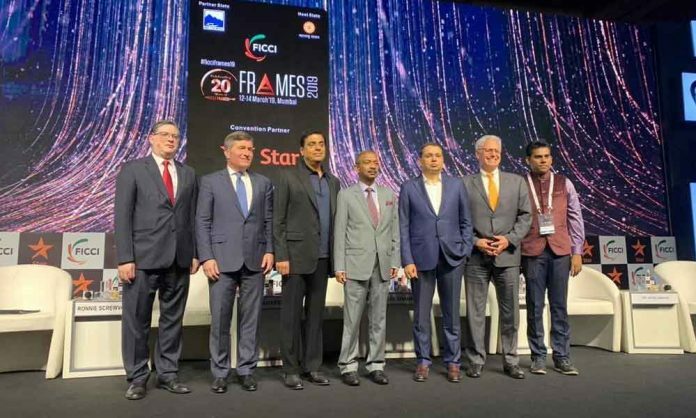 NITI Aayog Additional Secretary, Knowledge Innovation Hub, Mr. Sanjeev Sanyal, Principal Economic Advisor, Ministry of Finance, Goverment of India, Chaitanya Prasad, OSD, Ministry of Information & Broadcasting, Ronnie Screwvala, Chairman & Co-founder, UpGrad and Todd Yellin, VP, Netflix product to name a few. Several prominent names from Hindi film industry like actors Shabana Azmi, Divya Dutta, Kapil Sharma, Shilpa Shetty Kundra, Filmmakers Hansal Mehta, Onir, Nitin Kakkar, Ashwiny Iyer Tiwari, Sharat Katariya and producers Siddharth Roy Kapur, Priti Shahani and Guneet Monga were present as panelists in several discussions while Commentator and former cricketer Sunil Gavaskar came to unveil So Sorry Gully Cricket app by India Today Group. The event also saw unveiling of the FICCI EY report on the media & Entertainment and FICCI EY report on Shoot at Site. BAF Awards honoured the best of animation, visual effects and gaming industry. The 2nd edition of Content Bazaar saw more than 50 buyers from 22 countries. In a significant breakthrough, Singapore’s Aurora Media Holdings, one of Southeast Asia’s leading media companies came on board as co-producer for director Arun Karthick’s 2018’s highly appreciated Hubert Bals Fund winning project “Nasir”. FICCI FRAMES also saw a new initiative called Frame Your Ideas to help promote scriptwriters in the industry. Various renowned production houses like Aamir Khan Productions, Balaji Telefilms, Dharma Productions, Disney Studios, Eros Now, RSVP, Kabir Khan Films, SPE Films India Pvt Ltd., Viacom18 Motion Pictures, Jio Studios and Fox Star Studios to name a few, participated and met many scriptwriters during the course of three days. Going by the response this year, the next FICCI FRAMES surely promises to be grander.